Woolwich Arsenal in 1913 or is it? Tony published a welcome update for those of us not able to go yesterday to the House of Commons event and made reference to the team photo taken at the first match at Highbury, on 6 September 1913. This photo appears to have been used in the past to prove the veracity of the blackcurrant colours for the kit used in our last year at Highbury. However it may not be as it seems. In this photo it has the very bald Jock Rutherford (whose great grandson was a 2012 Olympic gold medallist and thus guaranteed to be on our TV screens seemingly forever) on the left hand side; also Bob Benson (who died after playing for the club in 1916) is the fair haired chap next to the goalkeeper. Charlie Lewis is sat on the far right. Jock Rutherford: “ Aged 29 Jock made his Woolwich Arsenal debut on the right wing against Nottingham Forest on 1st November 1913 and scored twice in a 3-2 win”. He wasn’t at the club in September 1913. Bob Benson: “In his first game for the club he played away to Bristol City on 29th November 1913”. He wasn’t at the club in September 1913. Donald Slade who is sitting in the middle played his first match for Woolwich Arsenal on 13th December 1913. This photo cannot be a picture taken of the team at the first game at Highbury for the very reasons given above. So when was it taken? The earliest it could have been taken was 13th December 1913 when all four players were in the team playing away against Clapton Orient. By looking at all the players and matching them against the team line ups in Andy’s Arsenal resource stats: http://stats.woolwicharsenal.co.uk/ it is apparent that the photo was taken either at home on 28 Februrary 1914 against Blackpool, or away on 28 March 1914 at Birmingham. 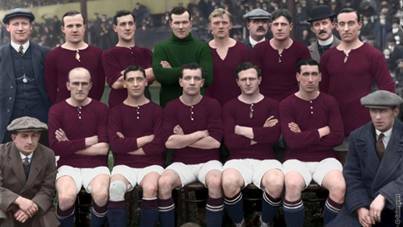 There is a rumour that it was also not even taken in colour in 1914 but was actually a black and white photo which may have been coloured in by a marketing department around the time of the last season at Highbury, giving the blackcurrant kit some historical legitimacy. As far as we can tell Woolwich Arsenal played in dark Garibaldi red though maybe for this one game where the photo was taken, they did play in a far darker kit than all the contemporary accounts, reports and pictures state. Certainly there was not the consistency of colour that we have nowadays and during our research we have found many occasions where both Woolwich Arsenal and Royal Arsenal did not play in exactly the kit assumed from previous histories. See below the 1914 depiction of Woolwich Arsenal colours as seen by the “League Colours” series from Godfrey Phillips. 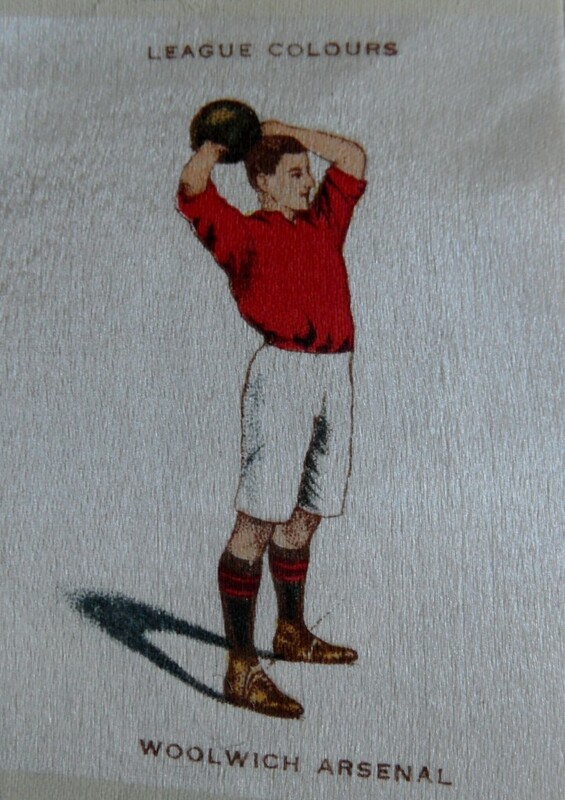 Godfrey Phillips Football Colours cigarette silk from 1914 shows the shirt as dark Garibaldi red, the biggest surprise being the depiction of the socks as black with red hoops. 2 comments to Woolwich Arsenal in 1913 or is it? This is most definitely a retouched black and white photo retouched in photoshop by one of Arsenal’s communication agencies. Probably for the final season at Highbury to market that special kit. Thanks. We have photos published prior to 2005 in black and white, which clearly show a deviation in shade for virtually every players shirt, especially the goalkeeper. “Oddly” these deviations disappeared when coloured in.